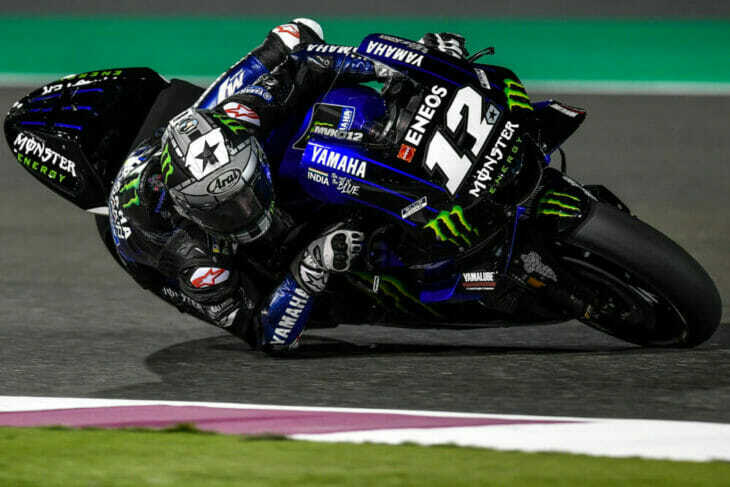 Vinales shone brightly under lights at Qatar. Now let’s see if he can back it up in two weeks’ time. The last three days of testing at Qatar ended with Maverick Vinales (Monster Energy Yamaha) back on top. There were four Yamahas in the top six, and (with other riders concentrating on race pace) an intriguing prospect for the first race of the season, at the same desert circuit in two weeks. Despite blustery conditions which contributed to several crashes, all but one of the top 10 were faster on day three, and times closed up. Possibly the conditions prevented a repeat of Sunday’s position, with all six makes inside the top 10—but the point was made. One of the strongest teams, Ducati, seemed as strong as ever. They had a raft of innovative ideas, although no spectacular time attacks at the end of the tests. But the usually dominant Hondas seemed on the back foot, with injured riders and important decisions not yet finalized. The other two Japanese teams both appeared to have gained strength over the winter. Although Yamaha riders were complaining about acceleration and top speed issues, the overall picture was much improved over last year. Suzuki riders and engineers alike had quietly moved a pace forward. Iannone continues his adaptation to the Aprilia. And the European rivals? Aprilia’s all-new contender has regained momentum, according to rider Aleix Espargaro, after a miss-step in 2018. 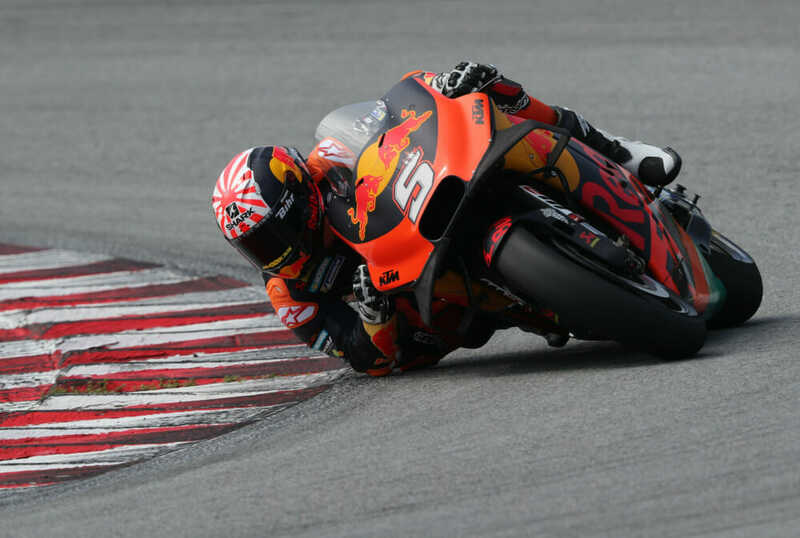 KTM’s conspicuous efforts—with tons of parts and constant development—can hardly fail to progress, now that they have four riders in addition to Dani Pedrosa as the new tester. The other sensations of not only the Losail test but also the preceding run at Sepang were blazing rookies. In Malaysia, it was Pecco Bagnaia (Pramac Ducati). In Qatar Fabio Quartararo (Petronas Yamaha), third on day two, was even faster to place second on day three. The final day’s times were faster for all the top riders except Alex Rins, concentrating on race pace. Even so, the Spaniard slotted into third overall on consolidated times. Today’s third spot belonged to Marc Marquez (Repsol Honda). 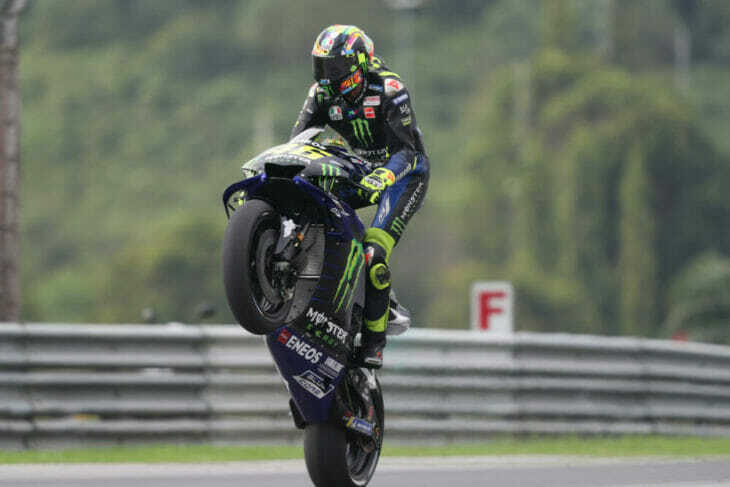 Valentino Rossi (Monster Yamaha) swooped up from 19th yesterday to fourth today. Another major improvement came for Jorge Lorenzo. 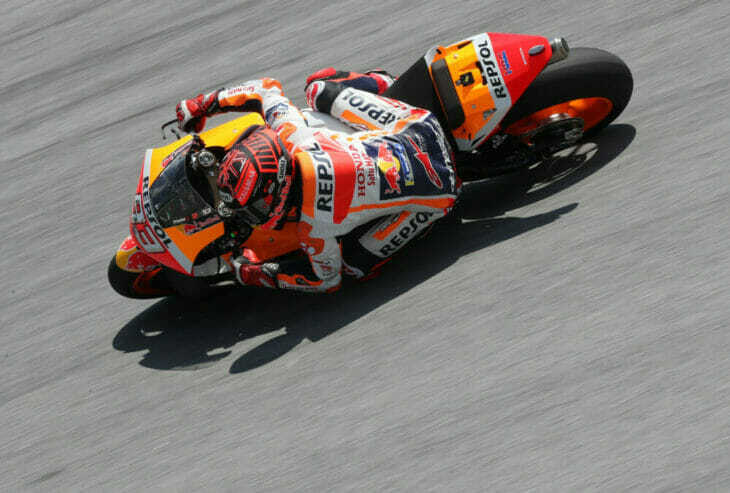 The new Repsol Honda rider, who carved better than a second off his Sunday time to place fifth today, was sixth overall. The second Petronas Yamaha rider, Franco Morbidelli, was up to sixth today. He was a tenth ahead of Pol Espargaro (Red Bull KTM), with Takaaki Nakagami (LCR Honda), Danilo Petrucci (Mission Winnow Ducati) and Jack Miller (Alma Pramac Ducati) completing the top 10. Suzuki riders Rins and rookie Joan Mir were next. As with Rins, Ducati team leader Andrea Dovizioso did not improve his time. He concentrated (as did other Desmosedici riders) on race pace, and ended up 15th on combined times. Marquez led the crash list, with two tumbles. Lorenzo also fell late in the day as the dew came down, appealing to race officials for an earlier race time in two weeks. Others to fall included Johann Zarco, Cal Crutchlow, Pecco Bagnaia, Tito Rabat, Nakagami and Alex Rins. 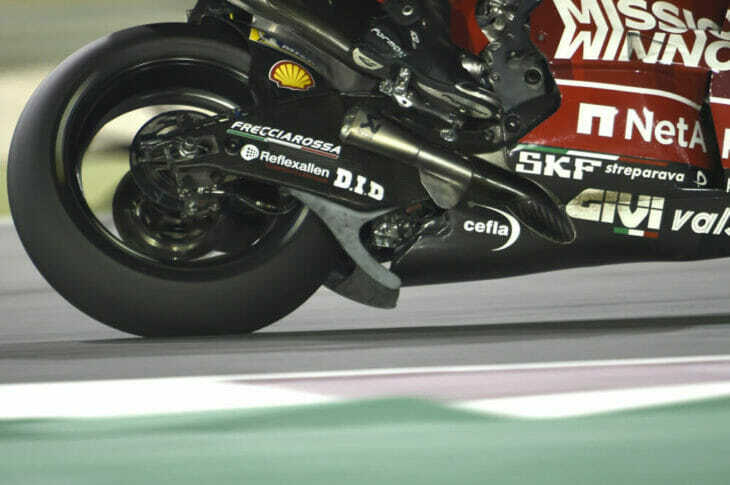 The air scoop under Petrucci’s Ducati. All-new six-wing bodywork and intriguing air scoops and shields front and rear attracted attention away from some core improvements apparent in the Italian stallions, with even more engine power and chassis revisions to address the perennial mid-corner steering problem. Lead rider Andrea Dovizioso had a typically calm series of tests at Sepang and then Losail, giving little away and working on race pace. “We didn’t try for a fast lap. The feeling is not 100 percent, but we have a lot of data to study. I don’t think we need to worry,” he said. New teammate Danilo Petrucci was more dramatic and several times faster. Pramac Ducati rider Jack Miller ended up 11th in Qatar, spending much of his time on the 2019 factory bike as the test mule. 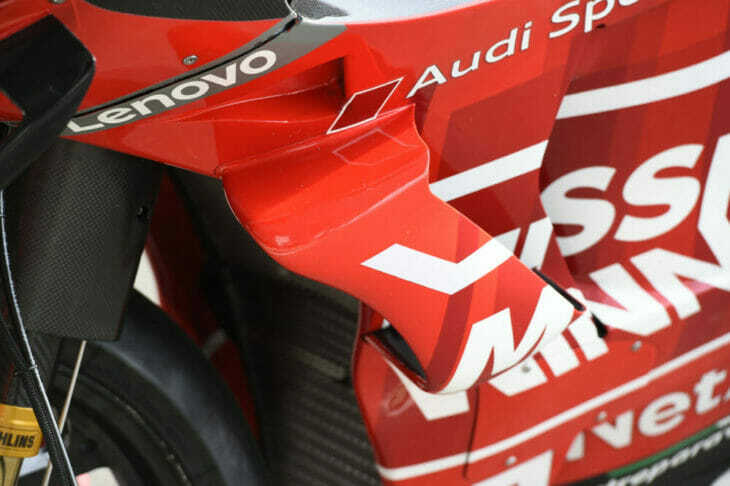 Ducati’s wing set-up keeps getting more and more intriguing. Teammate Pecco Bagnaia, on a GP18, didn’t repeat his stunning Sepang record second-fastest time. He did, however, report progress on front-end feeling and placed 13th. With the returned-from-injury Tito Rabat 16th and working hard and fast, and Reale Avintia teammate Karel Abraham 21st, Ducati start the season looking strong. As for the aerodynamics, the final decisions will be made before the first race at Losail. However, riders favored the new three-a-side winged fairing. The scoop under the swingarm is thought to direct cooling air at the tire. This is especially relevant to relative heavyweight Petrucci. The Italian suffered from rear-tire degradation last year. Yet, the plates below the front axle are simply mysterious. Marquez was back to his usual self, even crashing twice as proof. Honda’s aerodynamic innovation was a curious bow-tie wing high on the fairing, along with a new seat unit. And there was a new exhaust. But two downsides were apparent indecision about final engine configuration. They had two variations to choose from, and a lack of fully fit riders to make the crucial decisions. New Repsol teammate Jorge Lorenzo was back on a bike for the first time since a dirt-bike training crash mid-January. The get-off fractured his left wrist, and Lorenzo was at first tentative, but finally fast. He was still saving himself, running just 33 laps on the final day of testing. 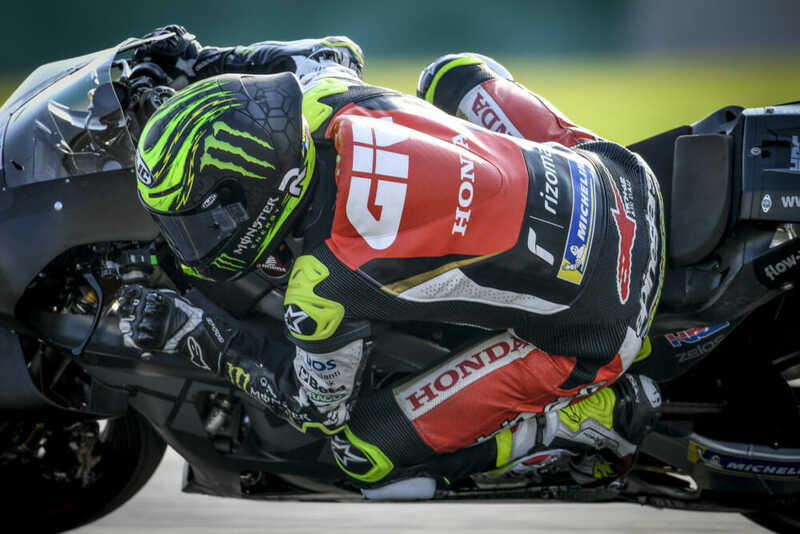 Crutchlow pounded out the laps on both the 2019 and 2018 Hondas. With LCR rider Takaaki Nakagami on a 2018 bike, this left only Cal Crutchlow to test the latest version. He is also still recovering from serious leg injuries in Australia last year. Crutchlow ran strings of laps as the test mule, precluding his own set-up plans, and leaving him “far from ready to race”. He was complaining about a serious lack of front-end feeling. He even ran laps on Nakagami’s older bike, giving a back-to-back comparison, and suggesting some uncertainties within the camp. 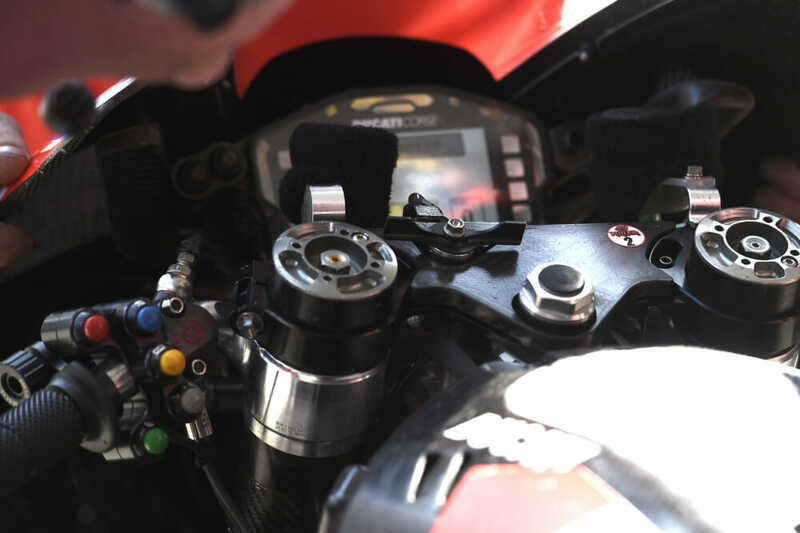 These were reinforced when Dorna pit-lane reporter Simon Crafar was told by team boss Alberto Puig on Sunday that they had yet to finalize the choice between two different engine configurations. Even so, given the strength of the riders, the team and the company, and the test times, nobody could think of Honda as anything but a serious title contender, and possibly with both rather than just one Repsol rider. 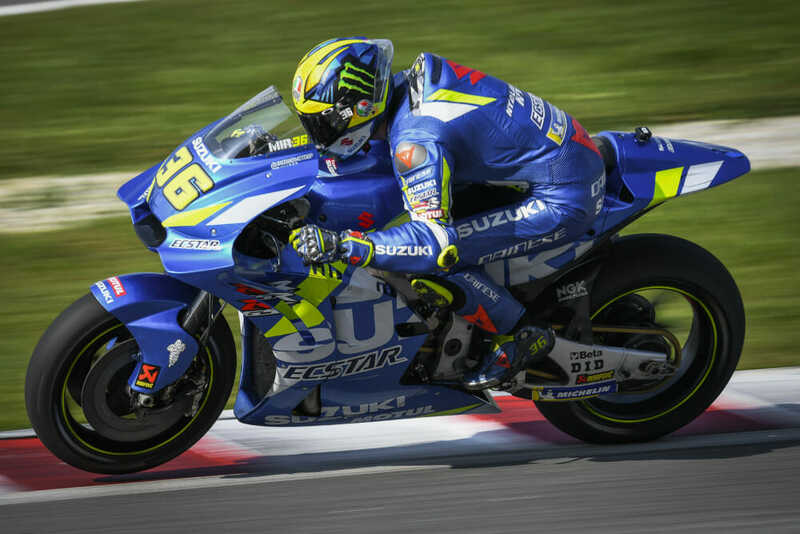 Mir continued his steady progress with the GSX-RR, with the majority of the testing work falling to Rins. A power-up engine and revised chassis left Alex Rins describing it as “a little bit better in all areas”. He set highly impressive times, second on day one, fastest on day two and 11th today. Rookie teammate underlined the Ecstar Suzuki’s well-balanced strengths by placing 12th overall, running steady fast laps. Rins is regarded as a potential race winner this year, after a strong finish to last season. He has shown steady speed through this year’s tests, working on race pace as well as lap times. Rins has been consistently quick in both regards. Last year, the Suzuki was the bike Yamaha wished they’d built. This year, the distinction is not so clear-cut. Rossi was back on the pace but found the lack of top speed worrying. After two years on the skids, Yamaha had the most ground to make up. On the evidence of the tests this year, they’ve done it. The two strongest signs were both from Maverick Vinales: lap times and his general mood. Looks like the bleak days are over. Teammate Valentino Rossi slumped on day two but was right back at the sharp end by the finish. He finished fourth fastest, and just four tenths off Vinales. He echoed his Vinales’ views. 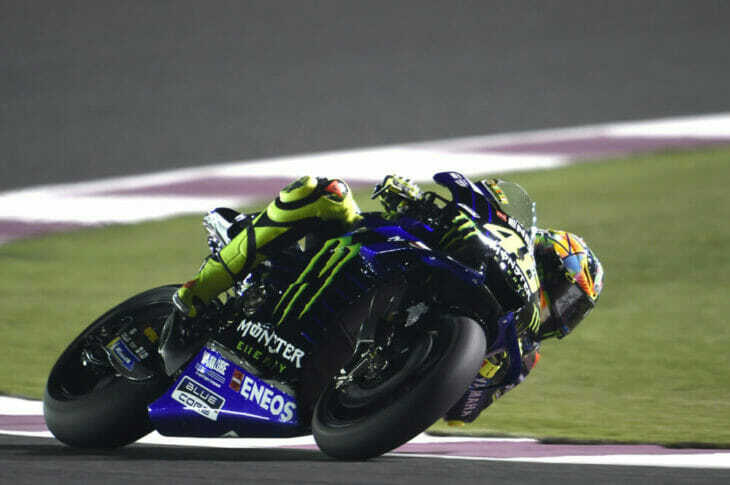 Rossi said, “We had quite a strong pace, and good time attack, but we need something more to fight.” Top speed was an issue, whether because of poor acceleration or a lack of power was not clear. Sensationally, class rookie Fabio Quartararo, however, was third fastest on day two, and second on the final day and overall. He was bubbling over with enthusiasm for the bike. Teammate Franco Morbidelli was also quick by the end, placed seventh overall. Technically, it has been a matter of balance. Small changes have been made—just enough to make a big difference. Zarco tried to remain upbeat about his chances but the times tell a different story for KTM. The team with the biggest hill to climb again arrived with the most equipment to do it. Technical chief Sebastian Risse said that while it was evolution not revolution, “there is not much left from the old bike: different frame, different swingarm, different weight distribution, different forks, different fairing”. Established Red Bull KTM rider Pol Espargaro was making the most of it. He improved from 10th on day two to an impressive seventh by the end, less than six tenths down. All eyes were on Johann Zarco, on pole here last year on his Yamaha, but now struggling. He cut a second from day one to the second, moving up to 18th, but couldn’t match that time on day three, dropping to 21st, and 19th overall. In the new Tech3 satellite team, rookie Miguel Oliveira was 20th overall. Hafizh Syahrin struggled to 23rd and last. Things are looking good for Espargaro and Aprilia, with sustained pace over the course of the race a key gain. The 2018 Aprilia was ridden with problems. The 2019 bike represents a fresh start. Based on an evolution from the 2017 version, rider Aleix Espargaro has marked a significant improvement. The chassis is new, the engine uprated. 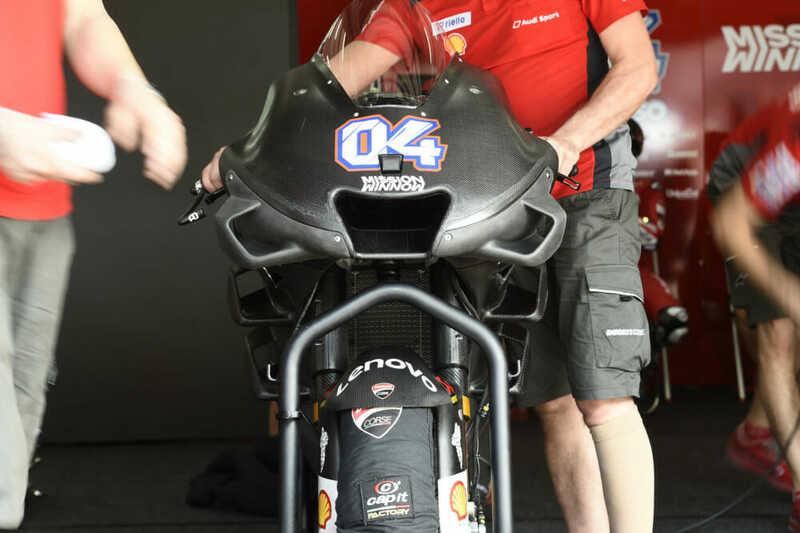 The most obvious is a new fairing, with Ducati-like wings. “The bike is clearly better than last year. I’m not sure if it is good for the top 10, but let’s try,” Espargaro said. He had made it to sixth on Sunday, but slumped to 19th on the final day, ending up 14th overall, but after a full race simulation, “with a lot of information to be able to be fast for 22 laps”. New rider Andrea Iannone was faster on Monday. Iannone placed 16th, but only 18th on combined times. New factory tester Bradley Smith was 22nd overall and will run as a wild card in the Qatar GP. 2019 MotoGP Test Results, Day Two, Qatar. 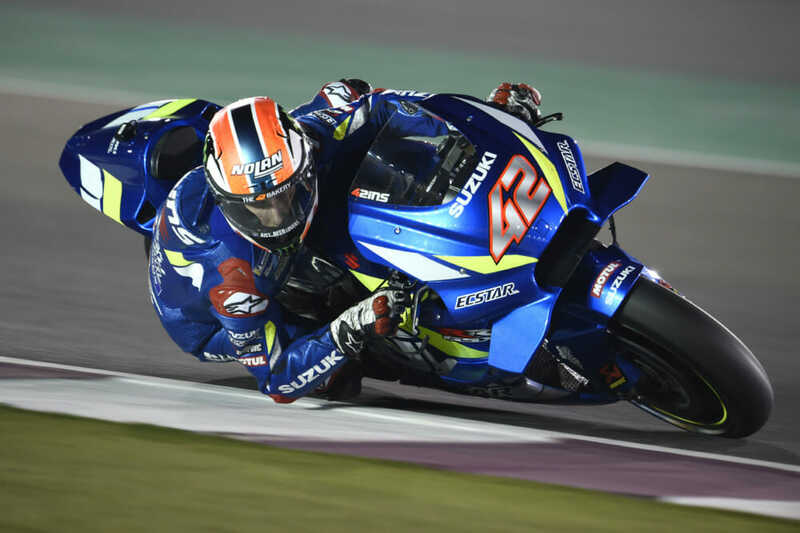 Suzuki’s Alex Rins was fastest on the second night at Losail in Qatar, changing places with second-fastest Maverick Vinales. He was less than a tenth down. Rins used his silky smooth style to go fastest on Day Two. He headed Saturday leader Vinales and the hugely impressive Quartararo. But as at the earlier Sepang tests, it was a class rookie that raised eyebrows and dropped jaws. This time the new kid on the block was 19-year-old Frenchman Fabio Quartararo. Riding a satellite Yamaha in the all-new Petronas team, Quartararo slotted into third. He was just three tenths adrift of Vinales on the factory Monster Yamaha, in just his second outing this year on the 2019 M1. At the Sepang tests, it was Moto3 champion Pecco Bagnaia who put his Pramac Ducati in second as top rookie. This time, proving the volatility of the increasingly evenly matched premier class, Bagnaia was 15th. He was more than a second down. However, slippery track conditions were one factor that underlined the truism that testing times are only that. In racing terms, experience is expected to tell. 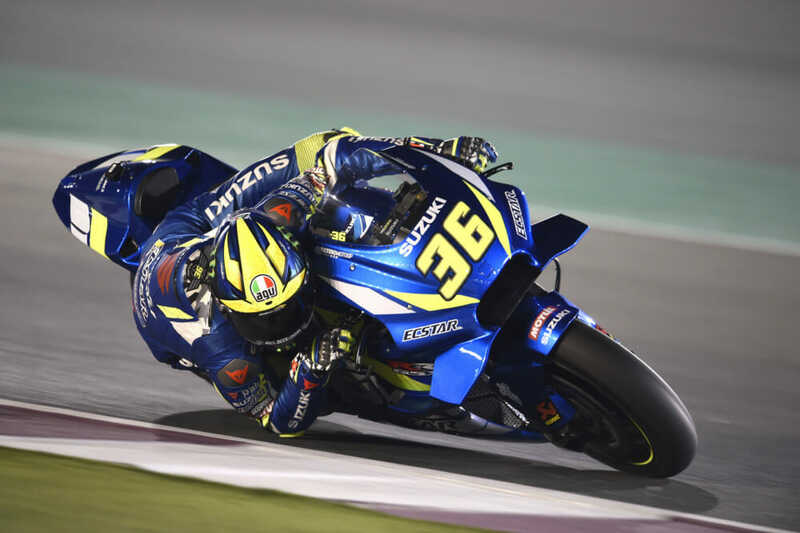 While 13 riders were within one second, with the fastest time was still almost two seconds off the Losail circuit’s best lap. Many riders, as Ducati’s Andrea Dovizioso pointed out, “we’re working on race pace not lap time”. Also, factory teams were still working not just on the usual settings, but also on finalizing engines and especially aerodynamics before the first race in a fortnight, after which no engine changes or bodywork alterations will be allowed, apart from one upgrade during the year. Repsol Honda had a full team, with new recruit Jorge Lorenzo back on track after his broken wrist surgery. Although still tentative and “having some problems with braking”, he placed 18th. Marquez, saying his own shoulder problems are close to completely healed, placed fifth, less than half a second off. Ahead of him, Danilo Petrucci was top Ducati, with factory teammate Dovizioso a typically steady eighth. Pramac Ducati’s Jack Miller placed 12th. Ducati had another surprise was a kind of wing/air scoop beneath the swingarm. The aim of this was seemingly to direct cooling air on to the rear tire. Miller tested this yesterday, and the factory riders today. Ahead of title candidate Dovi, Aleix Espargaro impressed on the latest Aprilia, with Ducati-like wings. Takaaki Nakagami was seventh on the LCR Honda. 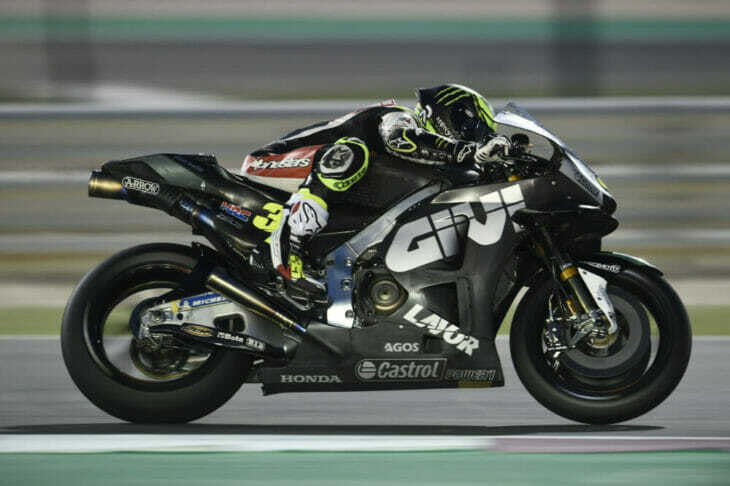 Teammate Cal Crutchlow, on the latest factory bike, placed ninth after. He spent most of the day running through a test program for HRC. Ecstar Suzuki riders Rins and rookie Joan Mir (11th-fastest) had a power-up engine, new twin exhausts, and new aerodynamics, with Rins confident in “small improvements in all areas” that offer strong race pace. 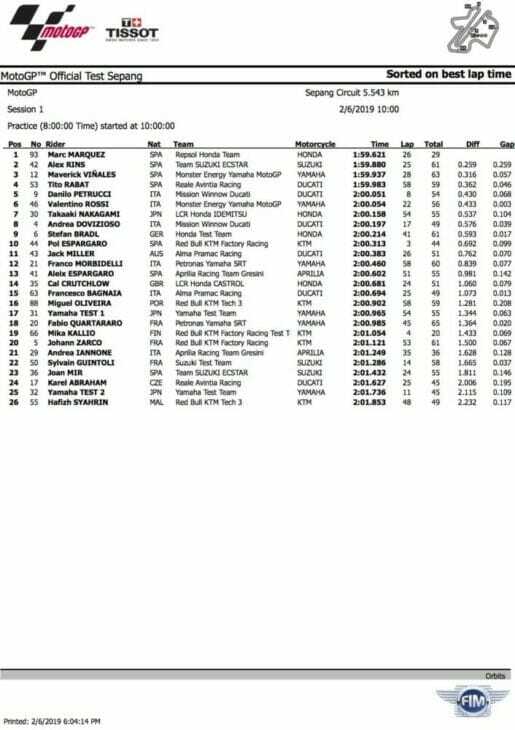 Pol Espargaro was top Red Bull KTM rider in 10th. And significantly, he was faster than new star teammate Johann Zarco, placed 17th. Valentino Rossi ended up a distant 19th. Rossi was the only rider not to improve on his first-day lap time, in spite of running 51 laps. 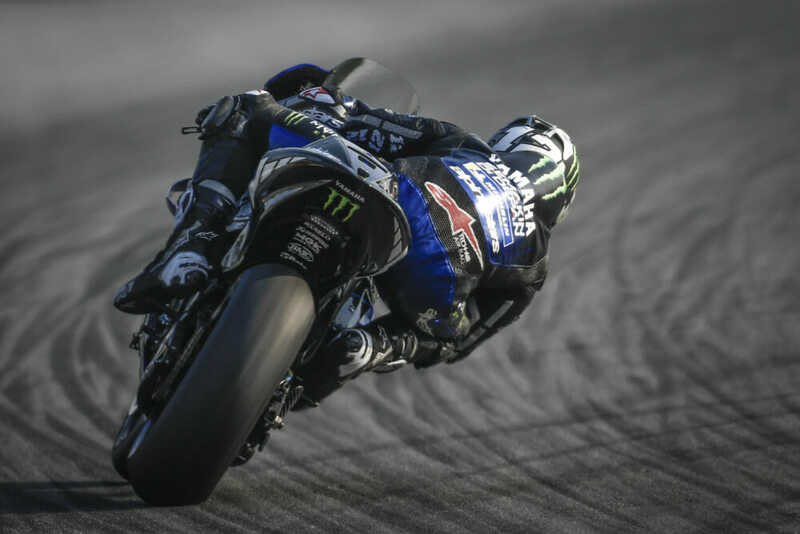 Monster Energy Yamaha MotoGP’s Maverick Vinales put in the fastest time during day one of the final MotoGP preseason test. The Spaniard clocked a 1:55.051 to edge out compatriot Alex Rins (Team Suzuki ECSTAR) by a mere 0.108 seconds. Mission Winnow Ducati’s Andrea Dovizioso was nearly four-tenths of a second off the pace in third, thanks to his 1:55.550 second lap. Vinales continued to make good on his early pre-season promise with the fastest day one time. Fourth at the conclusion of day one went to Dovi’s Ducati teammate, Danilo Petrucci. Vinales’ teammate Valentino Rossi, who recently celebrated his 40th birthday, rounded out a good day for the factory Yamaha squad in fifth overall. The surprising Tito Rabat (Reale Avintia Ducati, 1:55.694), rookie sensation Fabio Quartararo (Petronas Yamaha SRT, 1:55.772) Takaaki Nakagami (LCR Honda Idemitsu, 1:55.943), the ever-improving KTM of Pol Espargaro in ninth (Red Bull KTM, 1:56.040) and current World Champion, Marc Marquez (Repsol Honda, 1:56.264), who is still recovering from off-season shoulder surgery, rounded out the top 10. 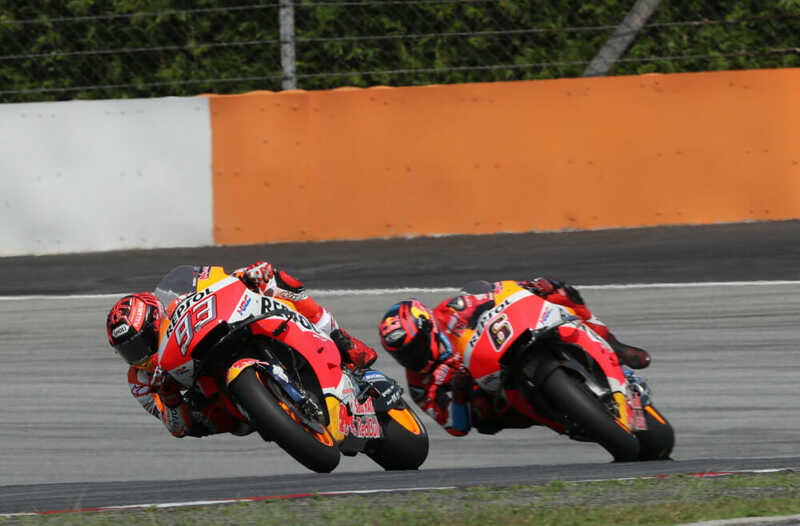 Marquez’s teammate, Jorge Lorenzo, was down in 22nd, hampered with pain under braking from a broken scaphoid suffered in a dirt track crash in the offseason. Testing continues today and we’ll have a full wrap for you at its conclusion. All manufacturers had new equipment or redevelopments to test, with Ducati again leading the way among the top factories, at least in outward appearance. Aprilia had a much-changed chassis, aimed at restoring the feeling and performance of the more successful 2017 version; while KTM had a reported 17 tons of freight and pit boxes groaning with piles of new parts. A new year, a new fairing for Ducati riders. They still have one more test before they need to select which ones they will run in 2019. He, factory teammate Petrucci and satellite Pramac team rider Miller exercised the GP19; second Pramac rider Francesco Bagnaia used his late-version GP18 to devastating effect. Reale Avintia riders Tito Rabat and Karel Abraham (14th and 20th) had similar late GP18s. Is Ducati running a motocross-style holeshot device on the Desmosedici? Apart from the six-wing fairing, the latest bikes featured a return of the drag link to the rear brake caliper (dubbed by some a “torque arm”, surely wrongly). This frees the swingarm from the torque of the rear brake. More mysterious was a lever on the top triple clamp, operating a cable that disappeared into the headstock area. Speculation marked this down as a possible “holeshot device” that can be actuated to hold the suspension compressed on the start line. The device lowers the center of gravity and helps reduce wheelies, and is an idea borrowed from motocross. The promised cooperation between new “friendly” teammates Petrucci and Dovizioso were especially clear on day one, when the first one led, and then the other. Marquez (93) could only manage a handful of laps each day, with most of the development work left to test rider Stefan Bradl (6). With its riders already having chosen between revised firing intervals at post-season 2018 tests, they were reporting better power and response, also in a generally improved package. 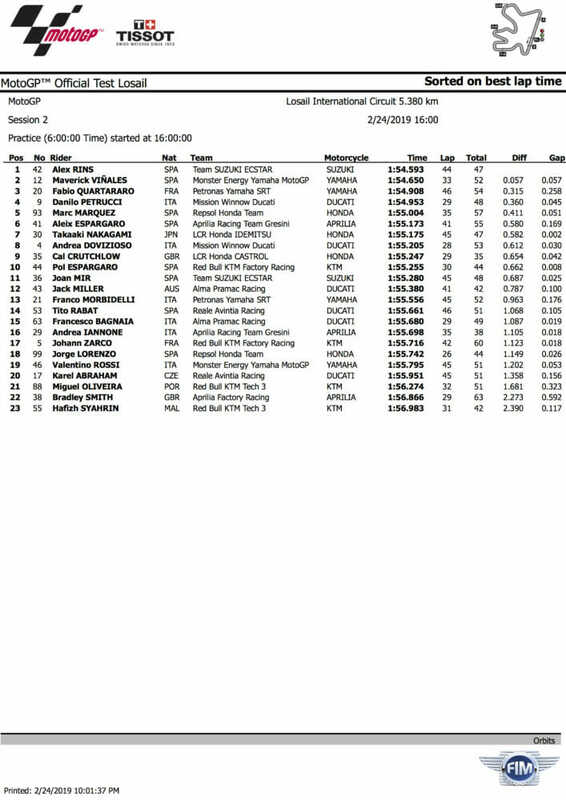 With Marquez still healing and Lorenzo absent, it was left to factory tester Stefan Bradl (13th) and sixth-fastest Cal Crutchlow to run through the programme on the 2019 bike. LCR teammate Takaaki Nakagami rode a 2018 machine to a strong ninth overall. Yamaha’s comments was guarded after the increasingly poor results over the past two seasons. However, the overall confidence level was palpably improved. 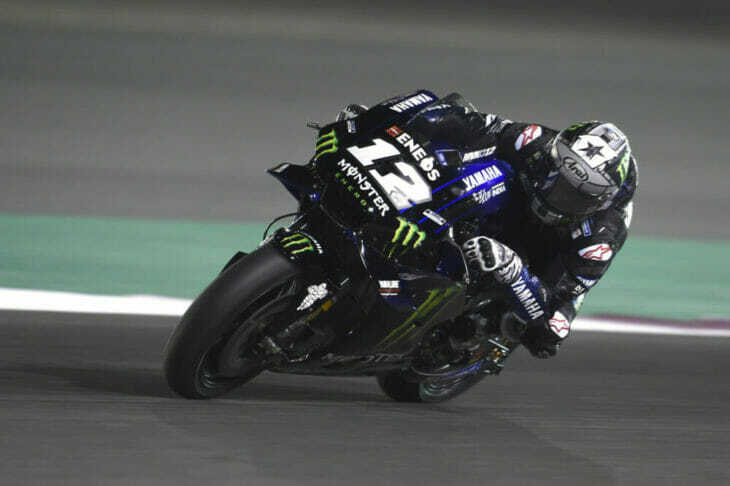 This showed most clearly in Vinales’s improved mood, as much as his fastest lap time on day two, and even more a 20-lap race simulation on day three that included five laps in the 1:59 bracket. It seemed more a matter of general refinement than anything specifically new, with the balance of the bike improved, as well perhaps as the balance in the pit, after a poor relationship last year with departed crew chief Ramon Forcada (now with the satellite Petronas team). The satellite SRT-Petronas Yamaha team were on the pace. Rookie Quartararo (20) was an impressive 16th and Morbidelli (21) was eighth. Following Hondas and Ducatis, “we were some steps behind, but now we are closer”. Rossi—who turns 40 on February 16, pronounced himself “half-happy”, after setting a best time some half-a-second off his teammate. At least Maverick’s pace had proved the bike was good, while the Italian said, “I feel good with the bike. Now some trials had been an improvement and others worse, but “now we have a direction”. 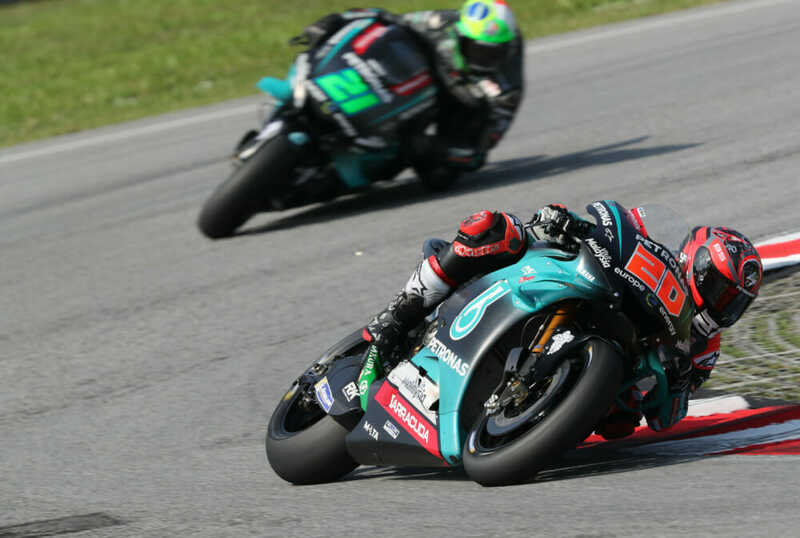 Franco Morbidelli and (rather unexpectedly) rookie Fabio Quartararo both had full-factory-spec bikes in the upgraded and newly Petronas-sponsored satellite team. Only Morbidelli is expected to be kept up to date with developments. Morbidelli was less than a second adrift in eighth; Quartararo impressive enough in 16th. Talk of a potential switch to V4 power proved to be mere speculation. Rins was consistently fast across the three days of testing and will be in contention for wins this year. The third Japanese bike could teach Yamaha a few lessons on steady development, with Alex Rins impressive for both speed and consistent race pace, and new boy Joan Mir making steady progress to place 15th. A new chassis emerged on the final day, when Rins posted more 1:59 laps than anybody, although falling to 12th in the single-lap scramble. The bike was in good race trim, he said, with his eye on potential wins. “We tried a lot of things, and we need to analyze the data, but we have a good base,” Rins said. This is important because his (and former teammate Andrea Iannone’s) podium successes last year mean the team no longer has concession privileges, allowing engine development and extra testing. Espargaro (41) has been wildly enthusiastic about his new Aprilia RS-GP. Iannone (29) missed the final day of testing. The acquisition of a new race-department chief—Massimo Rivola, ex-F1 Ferrari—has freed Romano Albesiano to concentrate on machine development, and the early signs were positive, with rider Aleix Espargaro saying that the 2019 bike feels “more like the 2017 version”. This may not sound like progress, but a misdirection in both engine and chassis last year had proved a backward step, and the consolidation was welcome—as was seventh overall on lap times. 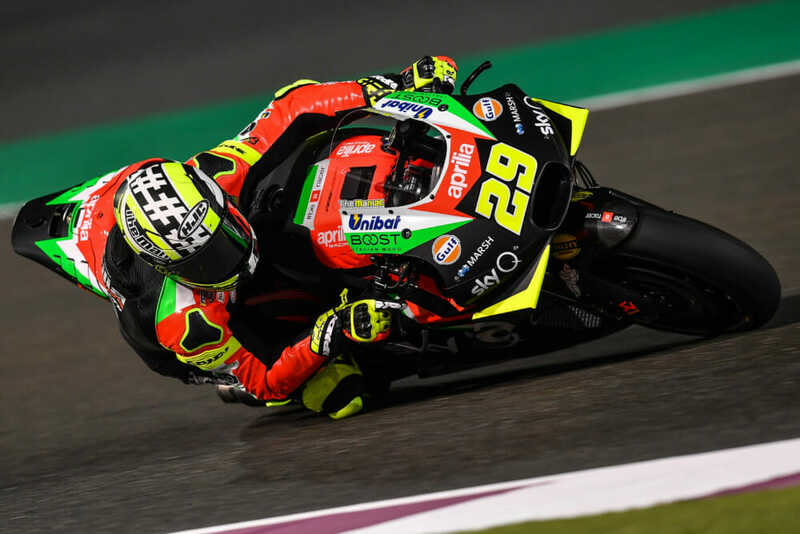 New teammate Andrea Iannone was at half strength and missed the last day entirely, after having been on antibiotics for more than two weeks with a dental infection widely believed to be the result of a second round of cosmetic surgery. Test rider Bradley Smith took his place on day three and was 23rd. 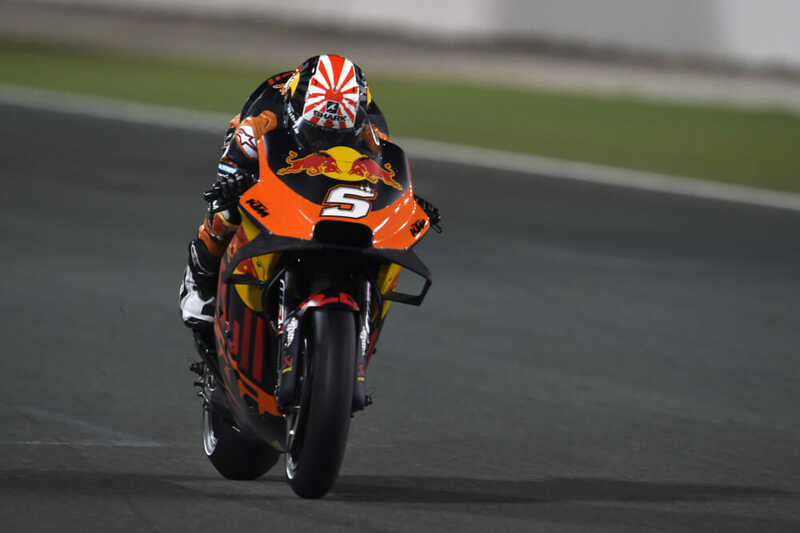 Zarco is thankfully getting the hang of the KTM, much to the factory’s relief. With a raft of new parts—including aero bodywork—to test, and now four riders to service, the Austrian factory had plenty to do and quite a lot to feel pleased about. After a very tentative start at the end of last year, new signing Johann Zarco was steadily getting up to speed and refining his requirements. At this stage, top of the list was more engine power. “And for my riding to get better on the corner exit”. The one-lap pace was still a problem, but the rhythm was impressive, with much-improved grip. 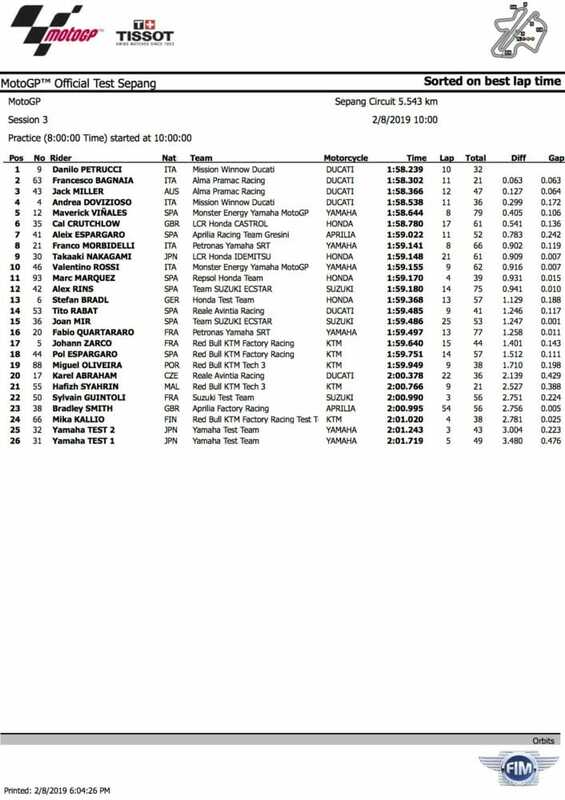 The third and final day of the Sepang MotoGP test saw Danilo Petrucci (Mission Winnow Ducati) scorch to a circuit record of 1:58.239 after 32 laps, but even that stunning lap was not enough to stop everyone talking about the new kid in town in Francesco Bagnaia (Alma Pramac Ducati). 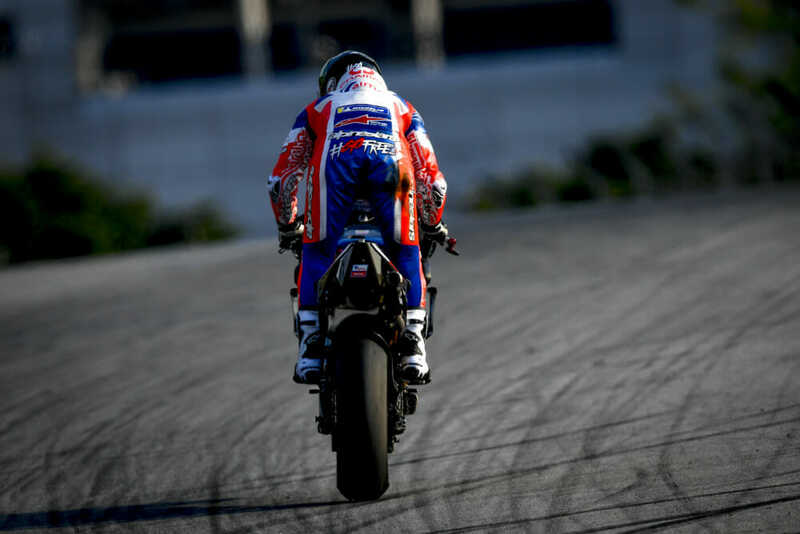 Petrucci smashed the lap record at Sepang, firmly announcing his arrival as a front runner for 2019. The current Moto2 World Champion scorched his way around the Sepang International Circuit to second overall with a 1:58.302 on the 11th of 21 laps, finishing ahead of teammate Jack Miller, Andrea Dovizioso (Mission Winnow Ducati) day two leader Maverick Vinales (Monster Energy Yamaha MotoGP) and Cal Crutchlow (LCR Honda). All riders in the top six went quicker than Jorge Lorenzo’s 2018 lap record of 1:58.803, set at the Sepang test in 2018. Catch me if you can! Bagnaia stunned everyone with his pace on day three, comfortably inside the lap record set by Jorge Lorenzo in 2018. Seventh at Sepang went to Aleix Espargaro (Aprilia Racing Team Gresini) on the much-improved RS-GP. 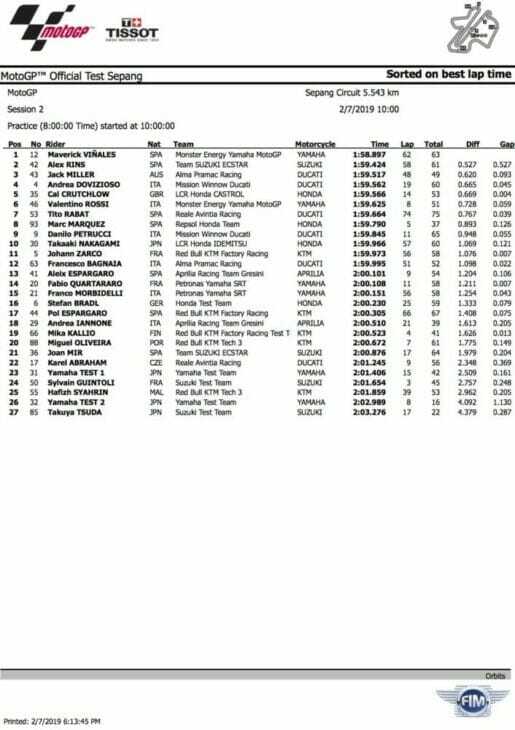 Following Aliex was Franco Morbidelli (Petronas Yamaha SRT), who made his first appearance in the top 10 at the MotoGP test results sheet at Sepang, Takaaki Nakagami (LCR Honda Idemitsu) and Monster Energy Yamaha MotoGP’s Valentino Rossi. The next round of MotoGP tests will be at Qatar on February 23. Monster Energy Yamaha MotoGP rider Maverick Vinales blitzed his way to the top of the Day Two times at the 2019 Sepang MotoGP preseason test, completing 63 laps and finishing half a second clear of ECSTAR Suzuki’s Alex Rins (61 laps) and Alma Pramac Ducati’s Jack Miller (49 laps). Vinales did not put in a qualifying tire and still nearly broke the lap record. Following a time attack run late in the day, Vinales posted a 1:58.897. This was under a tenth of a second outside of then-Ducati rider Jorge Lorenzo’s outright lap record set at the 2018 Sepang preseason. It was a positive day all round for the factory Yamaha team, with Valentino Rossi finishing sixth, 0.728 seconds off his flying teammate. Rins was once again runner-up. He was testing new fairings and various electronic settings as the Suzuki GSX-RR looks to cement its place as a front-running machine in 2019. Mir improved two places but still languished outside the top 20, while his teammate was second. Mission Winnow Ducati’s Andrea Dovizioso finished the day in fourth following 60 laps, one place ahead of the impressive Cal Crutchlow (LCR Honda, 53 laps), who used a thumb rear brake due to the limited movement from his still injured right ankle/talus. Crutchlow revealed at the start of the test he’d broken the talus in a staggering 17 places following his 2018 Phillip Island crash. With Rossi sixth, Tito Rabat completed the most laps of anyone with 75, once again put the Reale Avintia Ducati in the top 10 with seventh. A subdued Marc Marquez (Repsol Honda) was eighth. Marquez did not participate in a last-minute time attack, preferring instead to take extra care of his still-healing left shoulder following off-season surgery. Crutchlow was hugely impressive in fifth considering the extent of his foot injuries. Ninth after Day Two went to Dovizioso’s teammate Danilo Petrucci on 65 laps, with Takaaki Nakagami (LCR Honda Idemitsu) completing the top 10 after 60 laps. Red Bull KTM’s Johann Zarco had a much better day in 11th as the Frenchman is still trying to come to terms with his new KTM race machine. Zarco and KTM made some big steps on day two, with the Frenchman now sitting on the verge of the top 10. 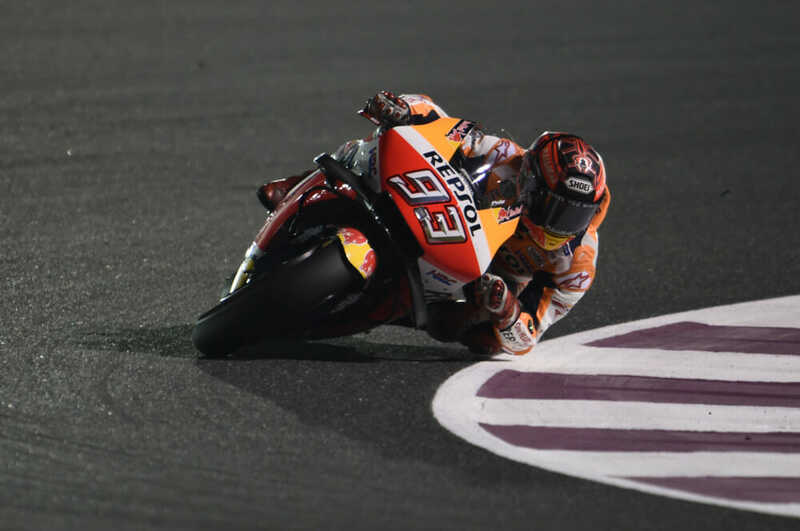 The first day of the 2019 MotoGP season finished with Marc Marquez (Repsol Honda) once again defying the odds to go fastest. This was despite the lingering effects of shoulder surgery over the winter break. Marquez didn’t ride much but still managed to top the first 2019 MotoGP test results sheet in Malaysia. The World Champion topped the opening session with a best time of 1:59.621. That put him 0.259 seconds faster than the impressive Alex Rins (Suzuki ECSTAR). It also was 0.316 seconds in front of Monster Energy Yamaha MotoGP’s Maverick Vinales. Marquez completed 29 laps across the day of the first 2019 MotoGP test. He was less than half those of Rins on 61 laps as he tried to ease himself back into the physical demands of riding a MotoGP machine. 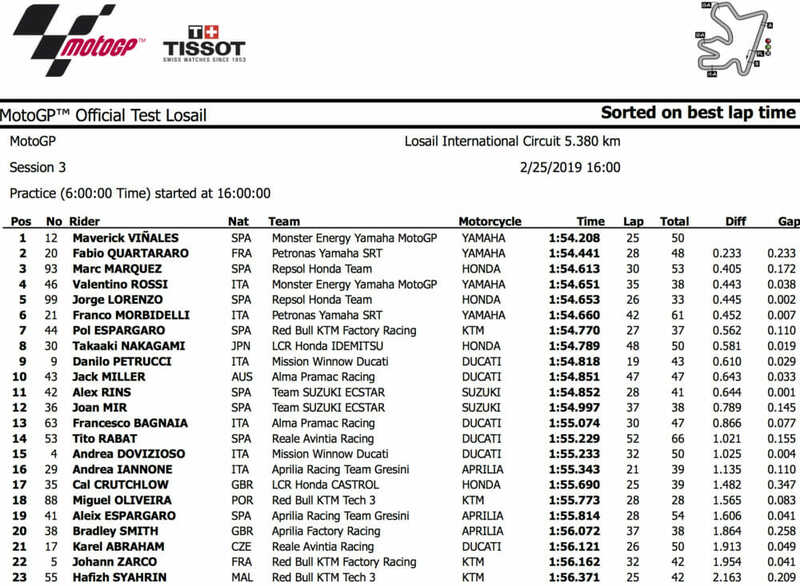 The first 2019 MotoGP test results sheet saw fourth go to Reale Avintia Ducati’s Tito Rabat. He completed 51 laps for a best time of 1:59.983, with new Mission Winnow Ducati signing Danilo Petrucci rounding out the top five with a 2:00.051 after 54 laps. New colors and a new attitude for Petrucci saw him up the front in Malaysia. Sixth on day one went to Vinales’ teammate Valentino Rossi on a 2:00.054 after 56 laps. He was one place ahead of Takaaki Nakagami (LCR Honda Idemitsu, 2:00.158, 55 laps). 2018 MotoGP title runner-up Andrea Dovizioso was eighth with a 2:00.197 and 49 laps on the board. 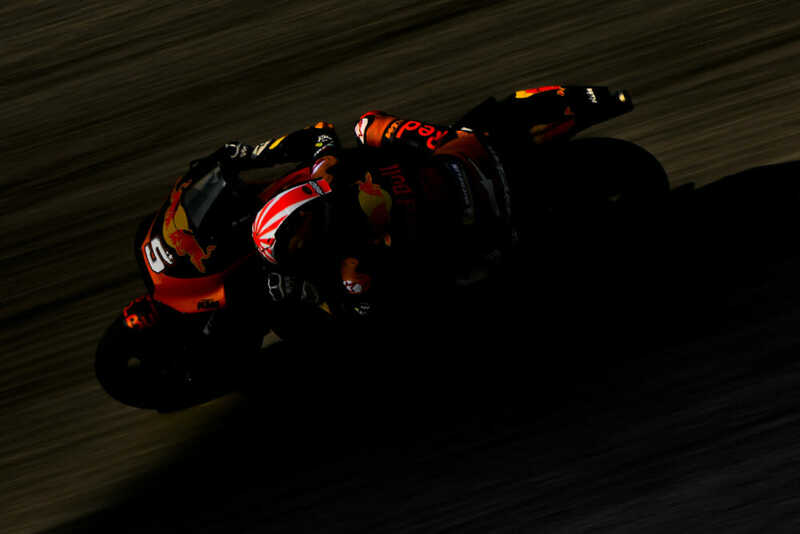 Stefan Bradl and Red Bull KTM’s Pol Espargaro rounded out the top 10. 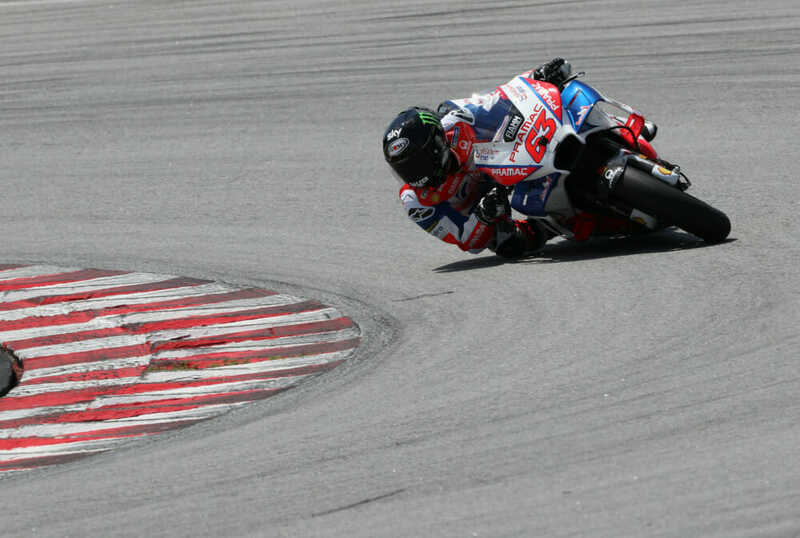 The top rookie at Sepang on day one went to Pecco Bagnaia on the Alma Pramac Ducati. He placed 15th (2:00.694, 49 laps). Fellow rookie Joan Mir rode his Suzuki ECSTAR machine to 23rd. He was 1.8 seconds off Marquez with a 2:01.432 after 55 laps. Bagnaia was once again impressive at the start of his rookie MotoGP season.